CORRELATION OF GENE EXPRESSION OF MAIN INFLAMMATORY CITOKINS AND THE SEVERITY OF CHRONIC PERIODONTITIS. Christina Popova , Velitchka Dosseva-Panova, Antoaneta Mlachkova. The understanding of the pathogenesis of periodontitis makes various progresses in the last decades. Today it is well known that the synthesis of high levels of pro-inflammatory mediators from gingival tissues in response to periodontal pathogens results in destruction of soft and hard periodontal tissues and clinical expression of periodontal disease. The occurrence of increased IL-6, IL-1β, TNFα and PGE2 levels in GCF or gingival tissue is capable to indicate risk of progression of destruction in specific periodontal site. Detection of gene expression of numerous major cytokines in high levels in gingival tissues and crevicular fluid may be indicator for activity of periodontitis and provides the rationale for the additional periodontal therapy. The current conception of the pathogenesis of periodontitis suggests that additional host modulation approach may inhibit the production of pro-inflammatory mediators in periodontal tissues and thus may enhance the treatment result. Popova Chr, Dosseva-Panova V, Mlachkova A. CORRELATION OF GENE EXPRESSION OF MAIN INFLAMMATORY CITOKINS AND THE SEVERITY OF CHRONIC PERIODONTITIS. J of IMAB. 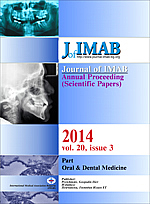 2014 Jul-Sep;20(3):563-566. doi: http://dx.doi.org/10.5272/jimab.2014203.563. 20. Kirkwood KL, Taba M Jr, Rossa C Jr, Preshaw PM, Giannobile WV. Molecular biology of the host-microbe interaction in periodontal diseases: selected topics: molecular signaling aspects of pathogen-mediated bone destruction in periodontal diseases. In Carranza’s Clinical Periodontology / [edited by] Newman MG, Takei HH, Klokkevold PR, Carranza FF. 10th ed., W.B Saunders Company, Philadelphia, 2006; Chapter 15.